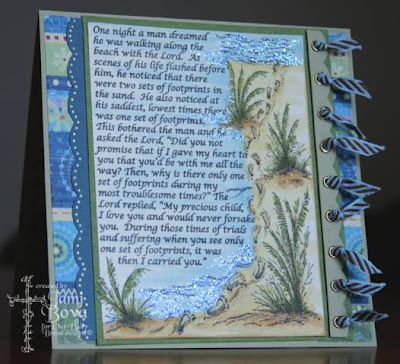 Divinity Designs, LLC Blog: Flashback Friday Favorite - Footprints in the Sand! Flashback Friday Favorite - Footprints in the Sand! Happy Friday! Hope your first week of 2011 has been fantastic! Are you ready to re-visit a classic Our Daily Bread designs stamp set? 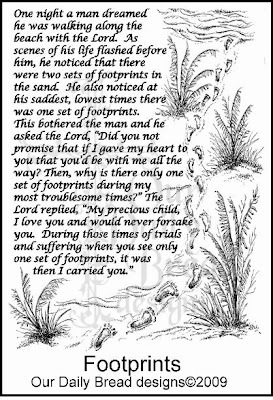 This week's pick is "Footprints In The Sand"....talk about an "oldie but goodie"....the Footprints Poem was penned in the late 1800's and is known all over the world! 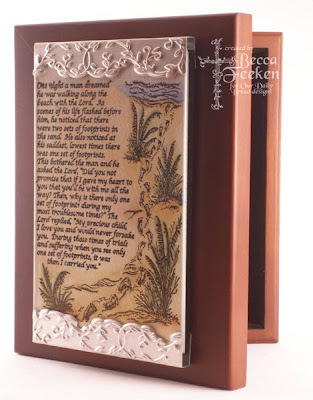 This beautiful story has touched countless lives in the past century, with its message of hope and faithfulness, and will continue to do so. Everyone goes through rough times, and it is so easy to be overwhelmed and to think that you are alone in your situation. 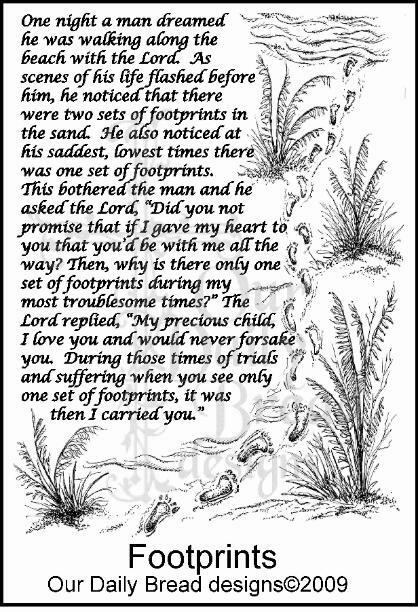 This poem shares the message that is all through the scriptures.....that He will never leave or forsake us! In our darkest moments, He is there with us! 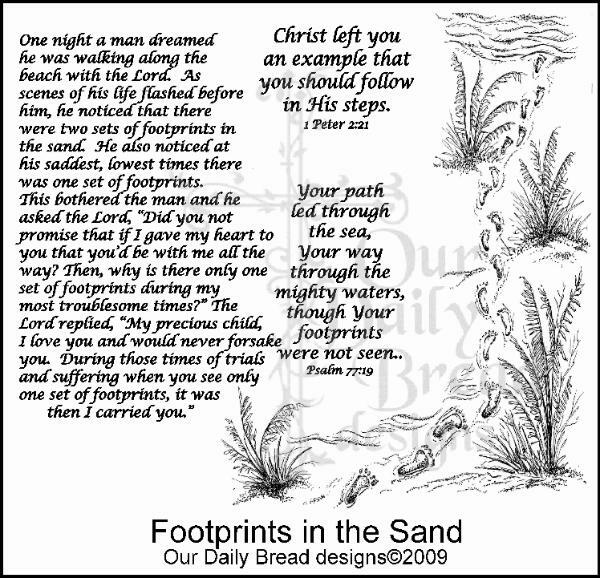 The Footprints in the Sand set includes the Footprints Poem, 2 scripture verses, and the awesome shoreline image. Also available is the Footprints Single stamp which combines the poem with the image. 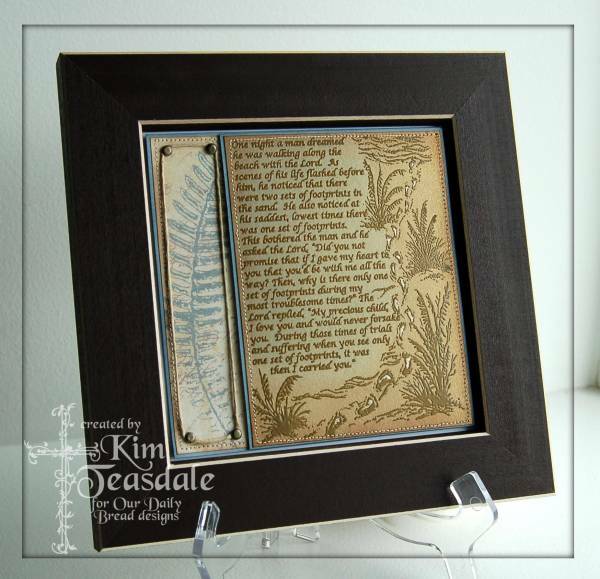 Aren't these samples amazing?! I love each and every one!! 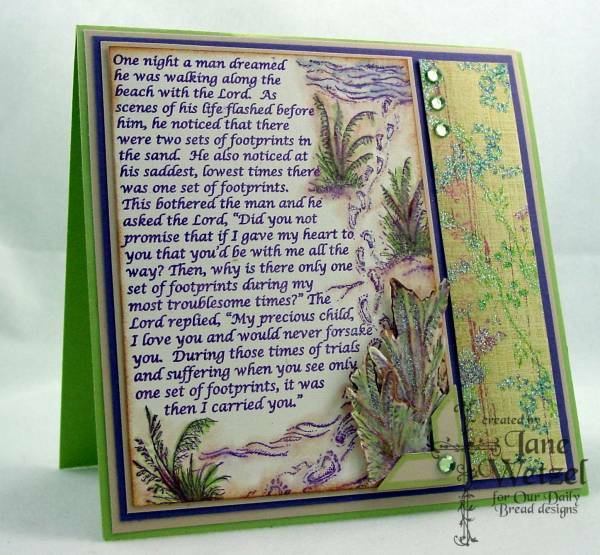 To see more creations using the Footprints in the Sand set, the Footprints Single, or any other Our Daily Bread designs stamps, please visit the ODBD Card Gallery.....get ready to ooooh and aaaaah!!!! Make sure you come back here bright and early Saturday morning for a brand new Shining the Light Challenge! 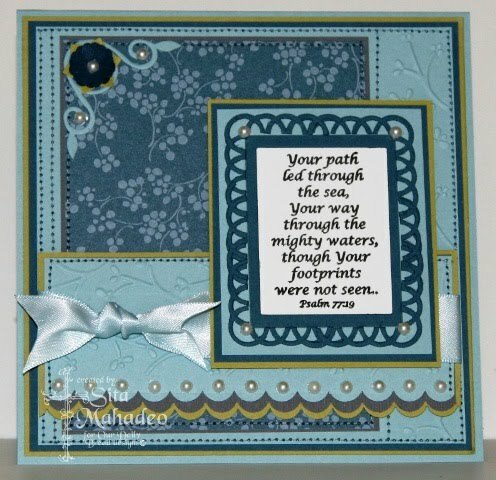 Not only do you have a chance to win $ toward ODBD stamps, but wait until you see the Challenge Team's samples....oh my!!!! Thanks so much for stopping by! 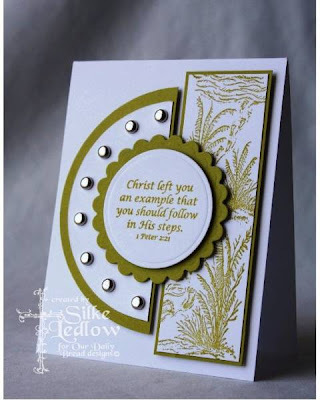 Have a very blessed weekend!!! 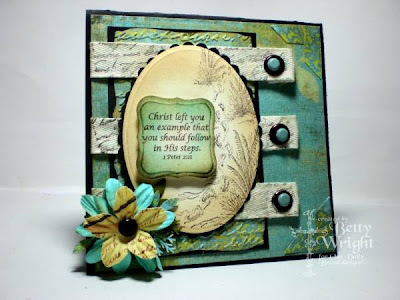 What awesome designers you have! 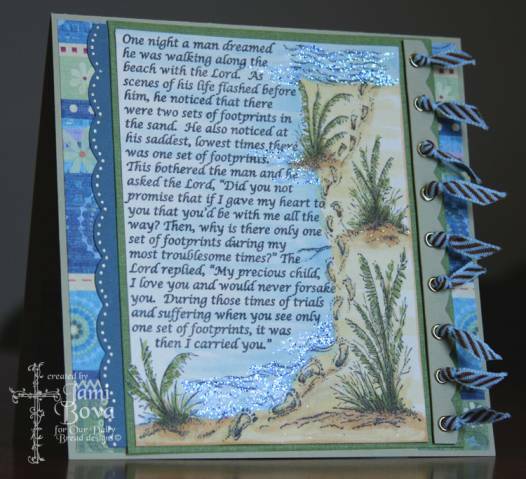 Love the different ways they have all used this stamp set! Beautiful! 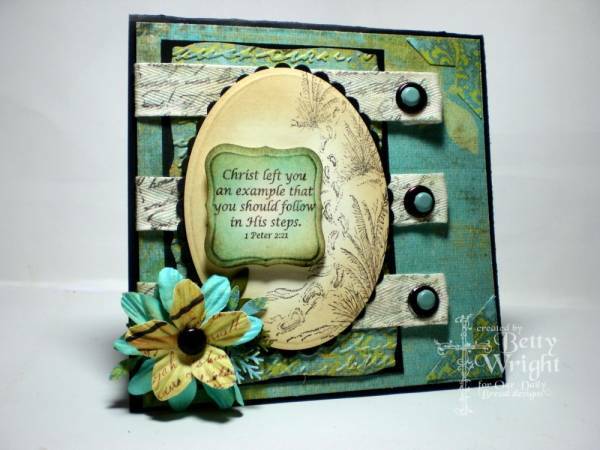 Wow these are all fabulous, every one of them is just fantastic!! 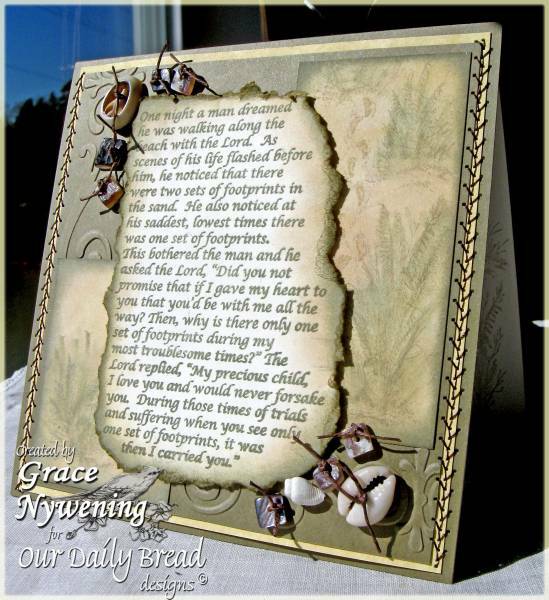 A great stamp set and all the cards are wonderful. Lots of talent there. Ooooh such beautiful creations! Thanks for the trip down memory lane Angie! I love this set! Oh I love to see all these ideas. I have this beautiful set and haven't even created anything yet. Boy it's hard to pick I like them all great job ladies.